It’s that time of year again. Put on your Santa hats and come along to the Dubbo BUG Christmas party on Saturday 1st December. 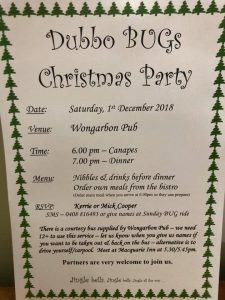 This year our Christmas party will be held out at the Wongarbon Pub. There will be some nibbles and drinks beforehand. Order own meals from the bistro when ready. Please RSVP to Kerrie or Mick Cooper by Sunday 25th November. Send an SMS to 0408 816 493 or let us know on Sunday!